This is the first post on the flexibility of the 3-4 Defense. Part 2 tomorrow will cover using multiple fronts. The 3–4 defense which evolved from the old 5-2 defense has gained popularity since the seventies due to the present day spread formations and the passing game which renewed its use by modern professional and college football teams. The 3–4 defense is so named because it involves 3 down linemen and 4 linebackers. There are usually 4 defensive backs. 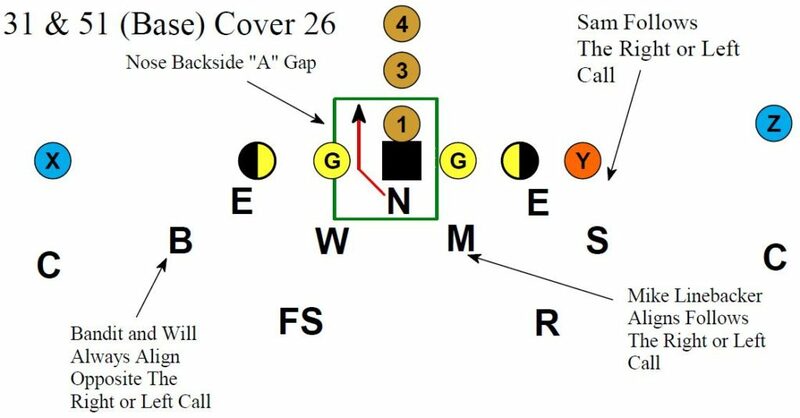 allowing eight cover defenders to occupy all throwing lanes. Typically, there are two major variations of the 3–4 defense. Both variations are directly related to coverage schemes on obvious passing downs. For the first type, the outside linebackers (inverts or over hang players) will rush the quarterback, the great majority of the time. On key situations, the rush linebacker will be sent to cover the flat on the opposite side of the blitzing defensive back; this is known as a “zone blitz”. This scheme requires outside linebackers to have the ability to back pedal and drop into coverage, of course they do rush the passer at times, it is just that they are much more likely to drop into coverage. 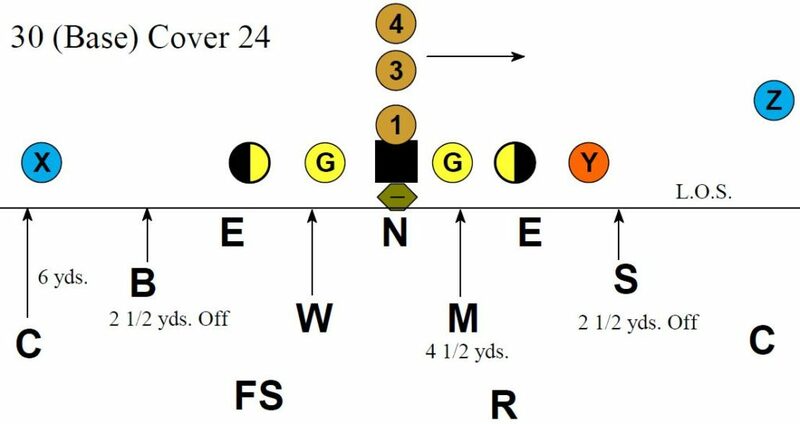 The following diagrams will give you the reader an idea of the flexibility for the 3-4 defensive approach. 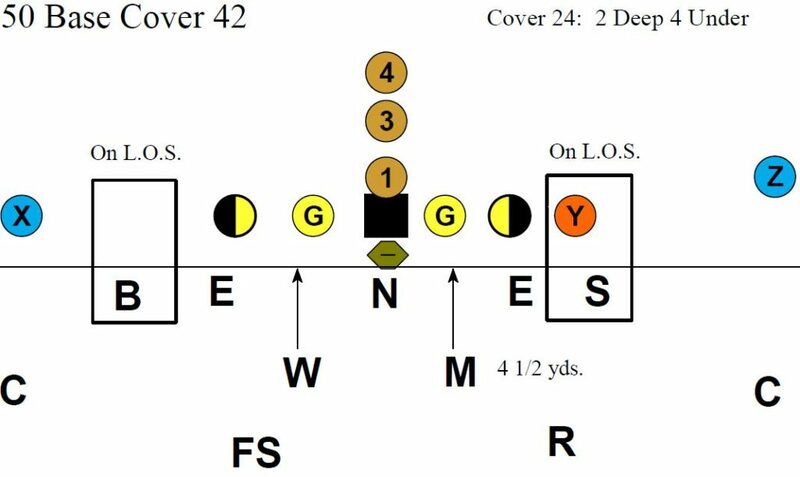 The base scheme when implementing this manual is the 30 front (3-4) which gives you a 3-man rush, while droping 8 defenders into coverage. Whenever you want to bring 5 defenders you only have to alert 50 and this now brings a 5 man front which includes the Sam and Bandit. 30 & 50 Front Equals playside “A” gap for your Nose in other words play off the center towards the “A” gap in the direction of the ball. 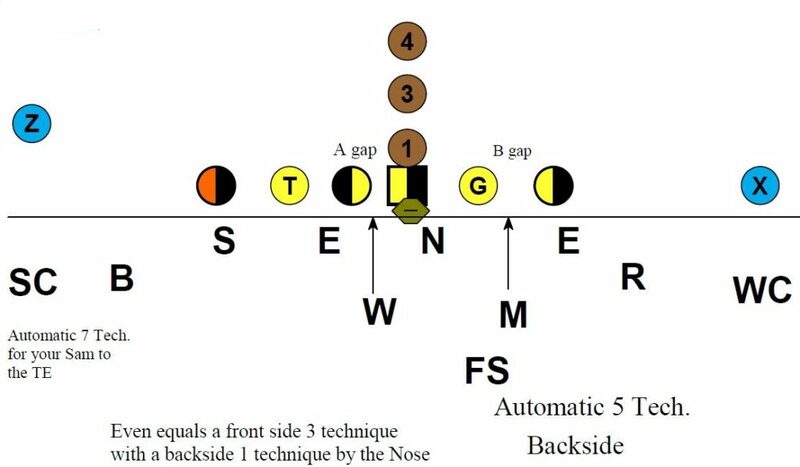 31 & 51 Front Equals backside “A” gap for the Nose in other words you have “A” gap responsibility backside of the ball. Automatic Alignment in the Even front gives you a 4-2-5 scheme off your base 3-4 schemes.